If you require an Aqua Mark in a 2nd location, an additional location running charge (based on quantity-see product page and click on 'view decorating information') AND applicable Aqua Mark running charges will apply. Production time for full order is 15-18 business days. A preproduction sample may be required for approval prior to full production. Longer lead times required for larger quantities. If you require a HD Aqua Mark in a 2nd location, an additional location running charge (based on quantity-see product page and click on 'view decorating information') AND applicable HD Aqua Mark running charge will apply. This new and revolutionary decorating option is going to be a game changer! It combines four colour process HD Ready and Aqua Mark. You can now print full colour logos on drinkware products that previously could only handle spot colour printing. A preproduction sample is required for approval prior to full production which can be done within 3 business days of artwork approval. Production time for full order is 15-18 business days after preproduction sample approval. Longer lead times required for larger quantities. A clear overlay is always required. Acrylic and stainless: hand wash only in lukewarm water with a soft cloth. Glass and Ceramic: top rack of dishwasher on the China/Gentle cycle. The process of debossing is offered on most of our leather, koskin, textura, EVA, and simulated leather lines only. A die is created of your logo and then pressed into the material creating an ‘impression’ of the logo. Debossing provides a subtle, yet higher perceived value on many products. Set up charge is included. Die charge is extra. Set up is also no charge on exact repeat orders assuming previous purchase order or invoice number is provided. Note: Dies are stored in-house for a period of two years. After two years a new die must be made and a new die charge will apply. To add value to some selected upper end products, a logo is transferred from a sophisticated computer generated program onto a durable adhesive backed vinyl substrate. Four colour process decals look stunning and are a great alternate decorating option. PMS colour match not available. 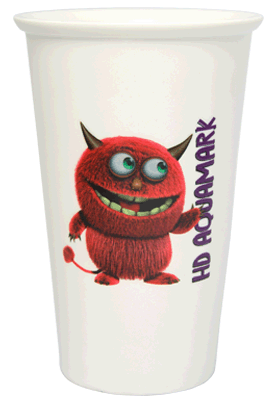 The power of HD – now available as a full wrap on drinkware (within 1/4") ! HD360 is a revolutionary process that allows you to put a full colour, high-definition imprint on drinkware (four colour process only). This laser-precision technique is a true four colour process, allowing for stunning and vivid imagery. A high-gloss lacquer is applied as a finishing step, making for an exquisite presentation. Not available on any drop or deals items. A preproduction sample is required for approval prior to full production which can be done within 3 business days of artwork approval. Production time for full order is 5-7 business days after preproduction sample approval. Longer lead times required for larger quantities. A clear overlay is always required. Affordable high definition four colour process decorating is now available. Inexpensive run charges combined with stunning high-resolution images makes this one of the industry's most sought-after decorating methods. Standard production time. Longer lead times may be needed for large quantities. If you require an HD Ready in an additional location, an additional location running charge (based on quantity) AND an HD Ready running charge are both applicable. With our Laser-Like decorating option you get the look of engraving for the price of screen printing. Using a frosted colour effect, matte ink is screen printed directly onto the product. The result is an elegant impression that resembles the subtle look of engraving. Laser-Like is a durable and scratch resistant option that is available on most clear Acrylic, Glass, and Eastman-Tritan™ drinkware products. Utilize imprinted pricing. Set up charge(s) extra. One colour imprint ONLY. Max size: 4” W x 4” H.
MAX Perfect Print allows a full colour computer generated logo to be printed onto heat transfer material and pressed onto a variety of fabrics like Bonded Leather, Koskin, Simulated Leather, Leatherette and Vinyl. This process is used on products that multi colour screen prints cannot be done on and is perfect for halftones and gradients. A full underlay must always be present (colour match not guaranteed). Optional die cut available. Experience a luxurious look and feel to your next promotional product with the addition of a sleek Zinc Alloy plaque. Your embossed logo is elevated from the surface allowing your brand to literally stand out! Available with up to four spot colours, add any design or logo to a variety of our bags with a WOW factor that’s unparalleled. Minimum 50 pieces. Height of plate is 0.5” H. Contact us for requests for different shapes/sizes. Similar to Perfect Print, a heat transfer allows a full four colour process computer generated logo to be printed onto clear heat transfer material and pressed onto natural coloured cotton. This process allows for a beautiful, detailed logo and is perfect for halftones and gradients. The fabric must always be light coloured to allow for the logo to be seen on the product. Commonly sized at 8” x 10” for cotton tote bags, but other sizes are available. PMS colour match not available. A four colour process paper banner on a white background is inserted between the double walls of the tumbler. We highly recommend this template be used when setting up your artwork for the paper banner insert. Because the shape of the imprint area is oblong, any artwork submitted as a square will be forced to arch in order for the imprint to fit in the template. This may cause warping. If you submit your artwork without using this template, please carefully review your paper proof to ensure the artwork is correct. Delivery lead time: seven business days after artwork approval (2,000 pieces or less with no preproduction sample approval). If a preproduction sample is requested or required due to complex logo, please add one week to delivery lead time. Delivery lead time: three weeks after artwork approval (includes digital preproduction sample approval). Add texture to your decoration with a raised PVC patch. The look and feel of this suave decorating technique emphasizes your brand with a touch of class. You can choose whether a raised look or a debossed relief suits your brand best. Regardless, the PVC patch offers a permanent look that’s impressive and durable. Minimum 50 pieces. Max size: 4” W x 4” H. PMS colour(s) must be provided. A transfer is created in a very similar method to screen printing, however, the ink is applied to a sheet of transfer paper instead of directly onto the material. The transfer is then pressed onto the product using a combination of heat and pressure. This method allows for unlimited colour separations that always require an underlay. Many products utilize this process as it assists in decorating products with foam insulation or hard to screen print locations.